Alanase Nasal Spray (Beclomethasone) is designed to help with the treatment and prevention of seasonal allergic rhinitis symptoms commonly known as hayfever. 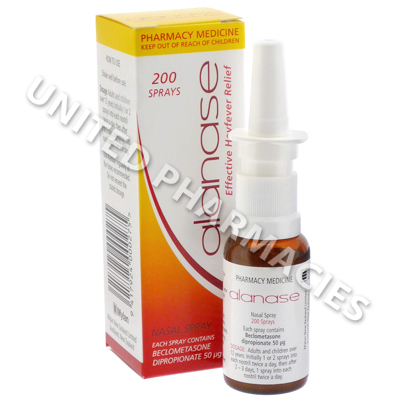 Alanase (Beclomethasone Dipropionate) is a nasal spray used to help prevent symptoms of allergies, such as sneezing, itchiness and nasal congestion. The active ingredient in this product is a type of corticosteroid, which works by reducing swelling and inflammation inside the nose. Doctors will also prescribe this product to patients who have recently undergone surgery to remove nasal growths (also referred to as polyps), as post surgery use of this product has proven successful at preventing the return of polyps. Alanase (Beclomethasone Dipropionate) nasal spray should be administered directly to the nose. Your doctor will tell you how often you should use it, as well as the length of time for which treatment is required. Adult patients are normally told to administer 1 to 2 sprays to each nostril twice per day. Before delivering the spray into your nose, it is recommended that you gently blow your nose. Some patients will notice an improvement in their symptoms very soon after using this product, sometimes after only 3 days of use. However, it will normally take 2 weeks for the full benefits of treatment with this drug to be noticed. If no improvement is noticed after 3 weeks of treatment, you should consult your doctor. While using this nasal spray to treat your symptoms, you should tell your doctor if any side effects occur. If you notice any other rare but more severe side effects, such as changes in vision, muscular weakness, increased thirst or any other side effects not mentioned here, you should immediately consult your doctor. Patients with a history of eye problems, tuberculosis, any other infections, nose problems, ulcers or any other conditions should tell their doctor before using this nasal spray. You are advised to avoid contact with anybody suffering from a contagious infection, such as influenza or measles. See your doctor if you have been exposed to any infections. Always use Alanase (Beclomethasone Dipropionate) as you have been prescribed by your doctor. Never self-medicate or change your dosage without first consulting your doctor. The correct dosage can vary depending on your health, medical history, and the severity of the condition being treated.